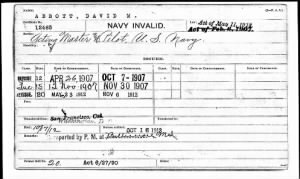 Do you have an ancestor who received a U.S Army or Navy pension between 1907 and 1933? Check out Fold3’s collection of US Veterans Administration Pension Payment Cards! These payment cards document pension payments made to disabled veterans of the regular Army or Navy or their widows between 1907 and 1933. Prior to 1907, pension payments were recorded in pension agency payment books, but in 1907, the pension bureau switched to a card system and transferred all active pensioners to this new system. The system changed again in 1923, when they switched from quarterly to monthly payments. Pension payments made under this new system were recorded on a new card. On the widows’ cards, the woman’s name replaces the veteran’s, and the veteran’s name replaces the disability information. There is also a space for payments made to minors. Since payments were made to widows as well as to the veterans themselves, your military ancestor might have a pension payment card even if he died before 1907. On Fold3, the cards are organized alphabetically by the surname and then given name of the veteran, even for the widows’ cards. This will save you time, as it eliminates the hassle of looking up a veteran’s pension under the name of his widow. Keep in mind that there might be more than one person with the same name, so double check that it really is your ancestor. If you can’t find the person you’re looking for in the records, try looking under any nicknames or aliases your ancestor may have used and also check alternative spellings. Get started searching or browsing for your ancestors in Fold3’s US Veterans Administration Pension Payment Cards today! I don’t think you will find your uncle in this database. WWII began in 1939. Paul w. Hiller was in the army during WW1 he died in February of 1936, but had his accident a few years before he died. My father served with the U.S. Army, he was a member of the 743th Tank Battalion and fought in many battles in WW2. He was wounded and when I (U.S. Navy vet) requested his metals from the Dept.of the Army they sent all his medals except the purple heart. Is there any way you could help in answering why his purple heart was not included. I would be willing to provide additional information regarding this inquiry. My Great grandfather Thomas K Allen a member of OVI 103, received a pension from injuries during the civil war..
What about the navy. I see that it does not included WW2 but what I really want to find out, was mom entitled to any benefits after she and my bio father seperatated? Please if you can, guide me as to how to find a photograph of my bio father. I would l ike one in his Navy uniform preferably the one taken in his dress uniform for boot camp graduation. heloo yours website is tottly diffrent i loveing it. Also. His name was George, Washington moore, or G W more as he was called. My father, Francisco Escano, was in WW 11, the Korean War, and the Vietnam War. He died 11 years ago. Can I get replacements of the medals he received during his Navy service? I’m the nephew of John Lee Merriweather , who served in the Korean War , WW11.. Please advise me of any service metals or the likes regarding his service .. My uncle lived in Atlanta Georgia …He is now deceased … Thank You … My name is Larry Barrow , son of his brother ,whom also served in the army ..His name was Albert Merriweather JR.
My uncle, Joseph F. Schlegel served in the Navy in the early 1900’s including the trip around the world. He died in Philadelphia about 1934 leaving a widow, Rhea? and possibly a daughter. I have never been able to find any records on them although I knew Rhea or Ray and would see her where she worked at Lit Brothers in Philadelphia during the 1930’s and 40″s.